Aigues-Mortes was a very pleasant lunch-stop on our way from Castelnaudary to Beaune in Burgundy. At the edge of the French version of America's "wild west", this ancient walled town is neighbor to the Romany camps, wild horses, cowboys, and fighting bulls of the swampland Camargues. 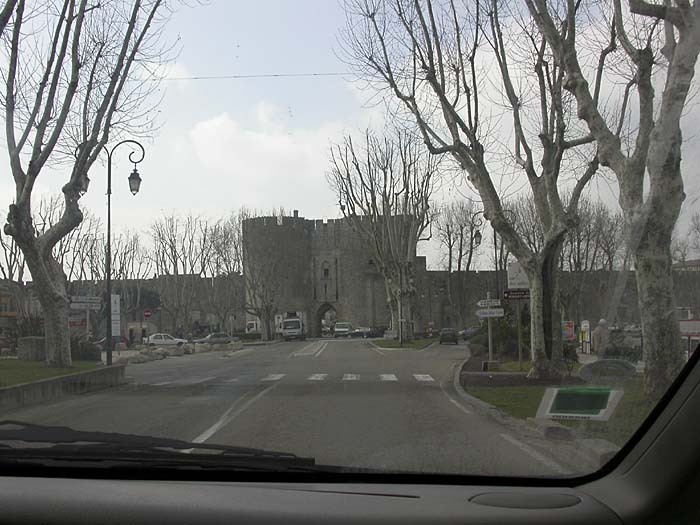 Aigues-Mortes is sort of what Carcassonne used to be--a remarkably preserved walled town-- but without several thousand acres of tour-bus parking fields. We found a little creperie decorated with bull-fight posters and memorabilia on a side street away from the central plaza, and next door to the Cinema Marcel Pagnol. Lunch was excellent.